After Halloween, is your little girl's favorite holiday April Fool's? When you come home and the house is quiet, do you get goosebumps, knowing that she's hiding behind a door waiting to spring out and spook you? Where did your daughter get this need for fear? What does she find so funny about putting a fake spider in your slipper? One thing is for sure, raising such a mischievous daughter is giving your nerves of steel. Usually you can see the funny side of her impish behavior but when her hijinks go too far sometimes you wonder where she's going to fit into the workforce. Well, it just so happens, this weekend there's a clown college open house. They have all sorts of classes from balloon animal making to the physics of fitting twenty grown-ups into a tiny car, yep, these things are more complicated than they look. From the way you described her, your child might be more interested in the menacing riddles course or perhaps she'd like to attend maniacal laughter 101. When she's checking out the class options she'll want to make a good impression to show that she's serious about the profession. 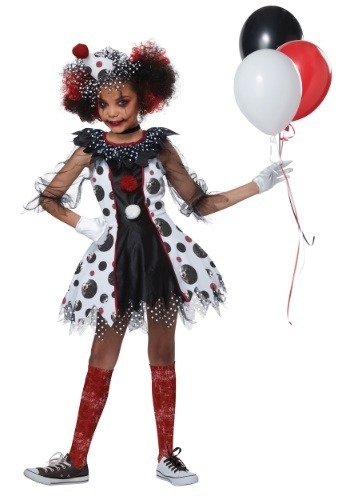 This creepy clown costume will let all the other jesters know what her intended major would be. She's sure to impress with this slightly spooky ragtag ensemble. While there are polka dots throughout, there are clown faces in the larger polka dots. Pom-poms and a pointed cap give this outfit that quintessential clowning look. Just add some clown makeup and a clown wig to make this ensemble complete. Maybe now that she's got the uniform she can try her hijinks on someone other than you, your nerves could use the break.